Daubenton’s kale (Brassica oleracea var ramosa) is a perennial vegetable that seems to have everything going for it: tasty, hardy, productive and easy to grow. I also grow nine-star perennial broccoli (Brassica oleracea botrytis aparagoides – actually a sprouting cauliflower) which is often touted as a perennial, but really it’s just a biennial that manages to hang on for a few more years if you zealously remove all the flowers. Daubenton’s, on the other hand, is the real deal, a perennial kale that usually lives for 5 or 6 years. It seems that a lot more kales used to be perennial, but Victorian seed companies selected for biennialism in order to be able to sell the same variety year on year. A few old varieties have hung on by being passed from gardener to gardener, leading to a plethora of names such as Ragged Jack, tree collards, Woburn kale, Taunton Deane and many others which may or may not be the same as each other. Worse, some biennial varieties share a name with perennial ones having been bred from them. My all-time-favourite biennial kale is Pentland Brig; there’s a rumour of a perennial version out there which I dearly hope is true. In Germany there’s an ehwiger kohl (‘everlasting kale’ or, as Google Translate charmingly puts it, ‘eternal carbon’). The bargain that Daubenton’s makes for its long life is that it is lived in complete celibacy. It is hardly ever known to flower [but see The Joy of Promiscuity], which means that it doesn’t exhaust itself, but adds a problem for the gardener: no flowers means no seeds, perhaps giving one reason why it is so rare. Fortunately, it is extremely easy to propagate from stem cuttings, particularly if you break off branches near the base. You’ll find some knobbles which are incipient roots. At most times of year you can plant cuttings or put them in water and the roots will start to grow. In autumn, Daubenton’s undergoes a brief hiatus when it slows its growth and sheds a lot (but by no means all) of its leaves. I’ve noticed that at this point its capacity to grow from cuttings is much reduced, so if you have failed to get them to root at this time of year, don’t give up. Another method is to layer branches by bending them down and burying a section. Over time the buried section will develop roots and make a new plant. I got my first Daubentons in 2009 from Pépinière Eric Deloulay in France. He’ll deliver to the UK but there doesn’t seem to be an English version of the website, so you’ll have to scrape your secondary-school French back together or Google Translate it and run the risk of buying some eternal carbon by mistake. I got two versions, one green one with a red tinge to the leaves and another, variegated, one with larger leaves. The Agroforestry Research Trust now sell the non-variegated variety and Pennard Plants have both kinds. Cotswold Garden Flowers sell the variegated form (plants simply disappear from their list if they are sold out, so if it’s not there, that’s what happened). I’m often asked about suppliers in the US and Australia. I haven’t managed to track any down, but if you’re a supplier, or know of one, anywhere outside Europe, let me know and I would be happy to put up a link. 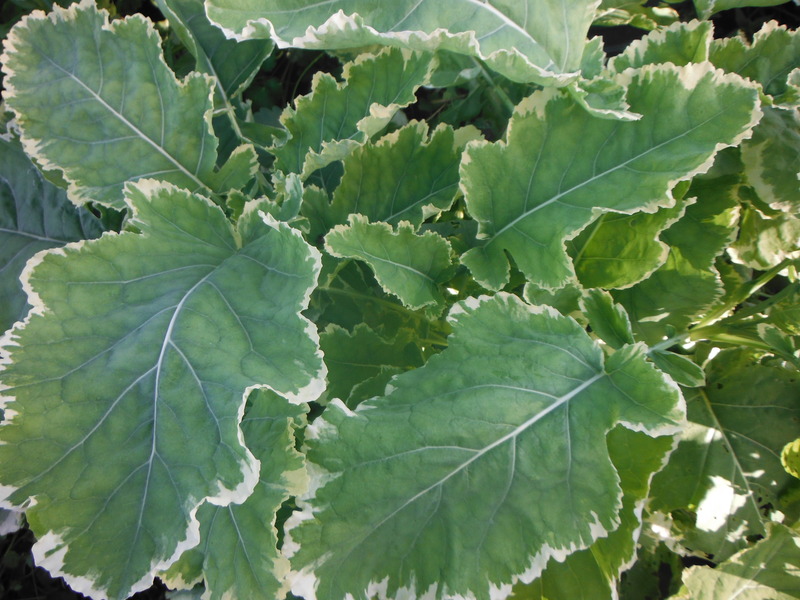 If you are in the States, you might like to look at the ‘Kosmic Kale’ supplied by the Territorial Seed Company. This claims to be a new variety but it certainly walks and quacks like variegated Daubenton’s. My original plants have now all died out but they have given rise to several generations of successors. A mature plant typically makes a dome about one metre high and wide and lasts for about 5 years. Winter hardiness seems to reduce with age and I usually lose some older plants over winter, but taking cuttings or allowing plants to self-layer seems to reset the clock. The worst cold my plants have had to face was -15°C one year, which they did with aplomb. I have planted cuttings in various positions in sun and part shade (under an apple tree) and they have thrived in all of them. This ability to tolerate shade makes them ideal for my forest garden set up. They are also said to be very tolerant of soil conditions. I use Daubenton’s pretty much wherever I would use an annual kale, in soups, stews and stir-fries. In summer I mostly use it as a pot-herb, usually in a 50-50 mixture with sea beet. The kale takes longer to become tender than the beet, so you have to make sure it is cooked enough. In winter the leaves become sweeter and tenderer, enough that I start to use them in salads too. They are also ideal for kale chips (i.e. crisps). Incidentally, Daubenton’s kale was named after the great French naturalist Jean-Louis-Marie Daubenton, a man who has had to suffer the posthumous indignity of English speakers constantly sticking an apostrophe into his name in order to make it look more French, so you’ll often find the plant referred to as D’Aubenton’s kale or even chou D’Aubenton. It’s also sometimes seen as ‘Dorbenton’, which seems to be an English phonetic spelling. 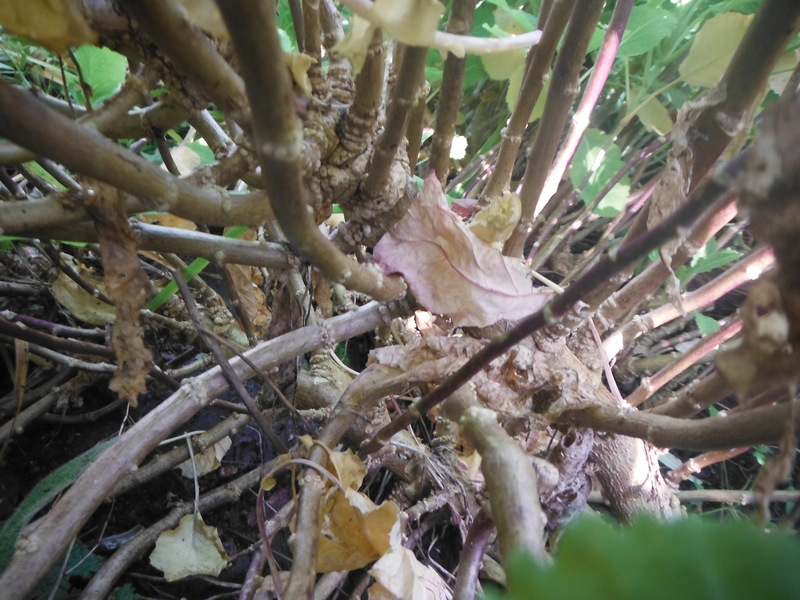 This entry was posted in Species and tagged Brassica oleracea ramosa, chou daubenton, cooking, Daubenton kale, Daubenton's kale, Dorbenton, forest garden, perennial kale, plants, unusual vegetables. Bookmark the permalink. The cuttings arrived safely before Christmas and are now sat in rootrainers, many thanks and happy new year! I would like to be put on the list for cuttings for perpetual kale and am happy to pay for plants and postage. Hi Sue. You’ve spurred me into creating a small shop page. If you drop me an email I’ll put you on the list and let you know once they’re available again. Hi Sue. There are cuttings available again now. I have one clump in my garden that I’ve had 3 years which a friend grew for 10 years before that. He in turn got the cutting from a lady who had it in her garden since she was a small girl, her father grew it before her so that one plant is over 70 years old and it has never flowered. I’m in new Zealand and because of our climate it won’t flower. It needs reasonably even temperatures between winter and summer. It’s a fantastic plant that we eat mainly raw in salads. Hi Richard, I live in New Zealand and have been trying to get hold of perennial kale for over two years now with no luck. I even wrote to the organic NZ magazine with no luck there so far. Can you tell me where in NZ you are and do you give or sell your kale cuttings. I am in Taranaki and am sure they would grow here. Hi, I’m currently growing some Daubenton’s kale from a cutting I got from Charles Dowding, who occasionally sells it. It’s growing beautifully but I’ve only had it a year – is it too soon to start eating it? That’s the eternal dilemma with new plants: grow them on or start eating? With Daubenton’s I would say that after a year it should be ready for eating if it is growing well. Hi Francoise. I don’t know. Mine have never been attacked by pigeons, but all my other brassicas mysteriously stopped being stripped by them in the year I got my Daubenton’s and never have been since. So possibly they have some magical effect that protects your whole garden, but I suspect coincidence. Daubenton’s have a different growth habit from biennial brassicas, making a multi-stemmed dome rather than a tree-like form with a strong central stem, so they may well be harder for pigeons to sit on and eat. They are certainly no less palatable. I would really like to grow this but my family doesn’t like kale. Does it taste more like cabbage or kale? Ps: is your shop up to date? Hi Sarah. I would describe it as more kale-tasting than cabbage-tasting, so your family might not be convinced. The shop is a bit out of date at the moment, in that I haven’t put all the seeds that I have been collecting this autumn up there yet. Soon! The Heritage Seed Library have seed they got from daubenton’s; I’m not sure whether it’s crossed. My plant is somewhat different from the standard green ones. There are no commercial sources in the UK; the best bet is to try Allotments4all; one or two of the people there have it. I may have cuttings in the spring, all being well. Hi Robert. There are a few commercial sources in the UK: the Agroforestry Research Trust have some and so do Pennard Plants. Plants With Purpose also sell them, but I can’t get their website up at the moment. Interesting to hear about the HSL seed. I have some crossed varieties growing on too, but it will take another year to discover which, if any, are perennial. My Daubenton’s kale is growing tremendously well, it’s about a metre wide and high now! If anyone would like a cutting for free you’d be very welcome, but you’d have to come over to my house and do it yourself. I live in Bath. There is a further indignity: Patrick Whitefield (RIP) called it Dorbenton Kale in his book ‘How to Make a Forest Garden’. Dorbenton is another variety, which I haven’t grown. It’s said to be weaker than Daubenton’s. They don’t seem to be a problem on Daubenton’s. In general I don’t have too much trouble with cabbage white in the forest garden, probably because of the crop diversity and the number of predators, but even when I have had a few they haven’t touched the Daubenton’s. This fits with what I have heard from others too. You mentioned a sprouting cauliflower/perennial broccoli. I am in USA so it would be a problem to send cuttings so I am wondering if this ever makes seed. If it does I would be interested in buying some. My Daubenton produced a few seeds this year but I missed harvesting them. I think that the resulting plants would show a cross with brussles sprouts which flowered profusely. Hi Jo Ann. Yes, it makes seed quite readily. I don’t have any at the moment but if you google ‘nine star perennial broccoli’ I’m sure it will be available in the US. I have both the varigated and plain versions of this, bought from Pennards, and they are about three years old. A couple of questions: do they move well as I have planted mine far too close together. They have become rather leggy. Can I give them a good haircut to encourage growth from the bottom? I hope to hear from you soon. Hi Cynthia. They take so well from cuttings that I’ve never tried moving a whole plant. Cutting them back too hard is risky as they don’t seem to have a lot of buds in the bottom half of the stem. Another option would be to layer a few shoots away from the opposite plant. That very quickly gives new growth from a low level. Nothing here in US. anyone there have some to spare. don’t have to do customs and phyto sanitary stuff to send seeds…just keep them from rattling around in the envelope.